Posted on March 18, 2019 Comments Off on Will China’s Needle Coke Shortage Derail Their Graphite Electrodes Production Plans? In late 2017, a crisis-like situation engulfed the steelmakers around the world that make steel through the Electric Arc Furnace (EAF) route due to shortage of graphite electrodes amid reforms in China’s steel sector, which further led to dramatic increase in the global electrode prices. How did the graphite electrodes crisis start? The Chinese government in 2017 decided to shut down on some of the illegal and highly polluting Industries emanating from serious environmental concerns and reports suggest that about 140 MnT of steel capacities, primarily Induction Arc Furnaces, Mini Blast Furnaces and some very old blast furnaces had been shut down in past two years. These closures led to a sudden and significant drop of export of finished steel from China to the rest of the world. All of this, helped the other countries of the world to increase their own production of steel which led to a sudden increase in the demand of graphite electrodes outside of China. In addition to a shortage in Electrodes, the demand for its key raw material – needle coke which is already short in supply also increased significantly. 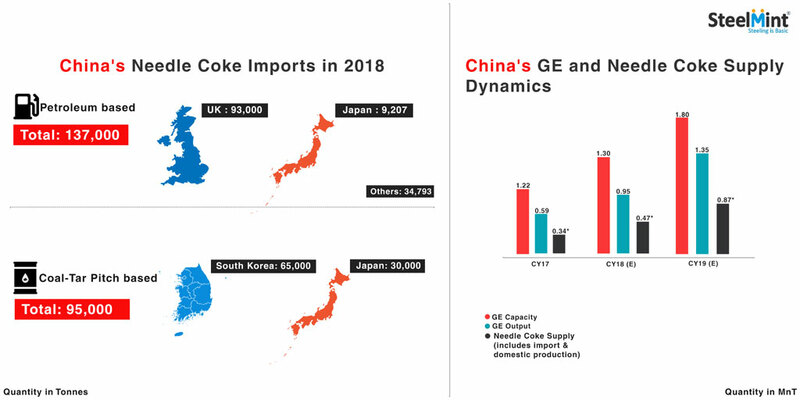 Along with this, the growing importance of electric vehicles (EV) in China has also led to the surge in demand of needle coke from EV segment. China’s closure of inefficient induction furnaces and polluting blast furnaces are expected to be replaced by electric arc furnace. New policy measures announced in China ensures zero growth in steel capacity by requiring steel capacity replacement to be kept in ratio – 1.25:1 or 1:1 (regional differentiation). Apart from this it is noteworthy that while the rest of the world produces approximately 45% of the total steel through Electric Arc Furnace route, China till recently has been producing just about 7-8%. The country has just about started to catch up with the rest of the world in this environmental -friendly way of producing steel. China has announced its intentions to produce about 20% of its steel through Electric Arc Furnace by 2020 which means that their Graphite Electrode and needle coke requirements could go up by as much as 3x over the next three to four years. However, one of the major areas of concern here is that China is adding EAFs more quickly than coke or electrode capacity and is also making substantial investments into their EV industry. China has substantial capacity in ladle electrodes but limited capacity for UHP (ultra-high power) electrodes that are consumed in the West. China utilizes lower quality electrodes sourced with pitch coke and can tolerate the lower quality given the primary product made is commodity grade rebar. Fangda Carbon is the only producer of UHPs in China and they are importing high quality coke from South Korea to supplement their production process. China has limited capacity of petroleum needle coke (used for UHP grade GE) and their domestic sources of premium coal based pitch coke for the manufacturing of high grade electrodes have been eroded from the blast furnace capacity rationalization over the past several years. China has plans to add more needle coke capacity but the majority of these plants are for pitch coke and face significant challenges of sourcing high quality coal tar pitch and producing at consistent quality levels. As Chinese coke is generally pitch coke (from coal tar) or some anode grade Calcined material that is being utilized in ladle electrode production, its availability is quite an issue. This is because pitch coke requires meaningfully longer bake and graphitizing time, which reduces effective capacity and also is a lower efficiency electrode. Lithium ion battery producers use a mix of petroleum needle coke, owing to its high density and therefore longer driving ranges and battery life span. Thus, in order to meet its needle coke requirement for UHP grade electrodes, China has to depend upon imports. According to China’s customs data, the country imported about 137,000 tonnes of petroleum-based needle coke in 2018, against 95,000 tonnes in previous year. Out of the total imports about 93,000 tonnes was imported from UK and about 9,207 tonnes from Japan. In case of coal-tar pitch needle coke, China imported about 95,000 tonnes in 2018 with highest volume of 65,000 tonnes coming from South Korea and 30,000 tonnes from Japan. Although China has plans to add more needle coke capacity in the coming years ahead, the plans for pitch coke plants face significant challenges of sourcing high quality coal tar pitch and producing at consistent quality levels and thus has to continue its dependency upon imports in order to meet its electrodes requirements for the new upcoming EAF capacities.